It considered the Community to be the institutional framework within which stability could be brought into its democratic political system and institutions. It sought to enforce its independence and position within the regional and international system as well as its “power to negotiate,” particularly in relation to Turkey, which, after the invasion and occupation of Cyprus (July 1974), appeared as a major threat to Greece. Within this context, Greece also sought to loosen its strong post-war dependence upon the U.S.A. Furthermore, accession into the Community was regarded as a powerful factor that would contribute to the development and modernization of the Greek economy and Greek society. Finally, it was giving the country “presence” in, and an impact on, the process towards European integration and the European model (http://www.mfa.gr/brussels/en/permanent-representation-eu/, accessed February 13, 2016). It was not an easy matter. Greece’s move was not greeted with open arms. Each member State had second thoughts about the country’s “readiness” to become a full member. It took them six years to decide. And when they finally did (strategic concerns won out), it was indeed a crucial moment for the future of the country for it opened the way for the formation of a sociocultural reality with distinct demarcation lines between the old and the new, the modern and the postmodern. At the beginning there were reservations on the part of the general public regarding the benefits of further integration in the departments of institutions, politics, and defense. Very few really understood the implications of this decision. Very few understood that joining this alliance also meant departing from the nation-state of modernity and embracing a cultural space that wanted to operate as the counter-image of the static state order, an institutionalized “more and further.” However, the gradual adoption of stronger pro-integration positions by the government had, by the late 1980s, lessened the reservations of the public. So, when the economic slump hit their door (2009) it caught everybody by surprise. It was like a thunderbolt that dramatically changed the morale as well as the psychology of the people. Overnight a whole nation entered the “real world” via a shocking crisis which created a rupture between the individual and the collective perception of the nation and its ideologies. What people thought was “there” and “theirs,” all of a sudden disappeared behind a vaporous wall of clouds. From the comforting “certainties” of modernism people passed to the discomforting openness (and dystopian uncertainties) of postmodernism that called for painful redefinitions and new poetics of representation. Long forgotten identity politics came back hand in hand with an identity crisis: Who am I? Who are they? Why me? People wanted to know whom to blame: the politicians, the malfunctioning system, the State, the Bankers (or Banksters), the International Monetary Fund, Europeanization, Globalization or themselves for their unconfessed Wrongdoings —their over-borrowing and overspending? We know that the more societies are confronted with situations which threaten their customs, values, beliefs, and standards, the more fearfully people cling to what is old, tested, or deceptively optimistic. That explains phenomena like the rise of populist nationalism. It happened in Bavaria in the 1920s with Hitler taking advantage of the economic situation in order to gain power; and it is happening now in Greece, in the years of crisis. For the first time in the country’s history, a fascist political party (Golden Dawn) has seats in the Parliament. This is something to worry about, for it shows that the depression is not just economic but spiritual as well. People have lost faith not only in their own government but also in Europe’s search for new forms of democracy. This loss has brought back with force the idea of national boundaries and national identity. Since 2009 contemporary Greek society lives in an intimidating rupture zone struggling to capture the diversity of the nation as it shifts and changes through the impact of migration, deep recession, global antagonism, nationalism, and the threat of GRexit (from the eurozone). It is quite clear that the meltdown of local economy calls for radical redefinitions on all fronts, individual and communal. It happens in all tragic (national) traumas: the moment of recognition opens the way (painful as it is) to knowledge and repositioning. The Theatre As for the theatre, all the changes taking place in the 1980s and the years that followed were as promising as they were perplexing. It was quite obvious that the rapid commodification and inevitable kitschification of a large part of Greek culture not only blunted the vision of many artists but also threatened to wipe out any potential radicalism intrinsic in the art of theatre. Theatre artists, especially those who began their career in the 1960s and 1970s and used their stage realism to dramatize various forms of oppression (mainly ideological and economic) and individual isolation, had problems accepting the idea that Greek society, like most western societies, had reached a turning point where the “motor of history” (class struggle/consciousness) no longer played the role it used to. This is not to say, of course, that post-1981 Greece had reached the end of ideology; nor is it to say that class struggle or class awareness all of a sudden ceased to exist. Rather, it simply suggests those concepts were in severe crisis, which called for a different dramatic treatment (for more on that, see Docherty 206; also, Mouffe 31-45). While in the years of Greek modernism (roughly from 1930 to 1980) there was a recognizable center of power (usually the State, the military or an elite economic class) and thus recognizable binary structures of “sameness” and “otherness,” now, in the years of postmodernism, one of the most serious consequences was the new facility of the established culture (commercial or otherwise) to recuperate or neutralize (in a non violent way) the oppositional power of any ideology, of any individual behavior or art form. Within this developing context, the margins of Greek society that hosted the most memorable and likeable figures of modern Greek theatre (the “Other”) either began disappearing or no longer drew the unquestioned sympathy of the viewer. The inside and the outside were becoming more and more indistinguishable and fluid. Iakovos Kambanellis’ slums and backyards, for example, were rapidly transformed into chic and expensive suburbs. Everything “Other” was becoming the “Same.” It was all the more obvious that the mere opposition advanced by local Marxism was not enough for a radical criticism, let alone for a convincing dramatization of contemporary/ postmodern Greek reality and history. The various forms of earlier local realism (good as they were in the 1950s and 1960s, even 1970s) were not in a position to understand that the postmodern self does not possess the depth, substantiality, and coherence that was the ideal and, sometimes, the achievement of the modern self (Baudrillard 1983; Jameson 1983 and 1991); that now we live in the world of the “simulacrum” and no absolute, totalizing claims can be made upon any fundamental ontological reality; that “we have reached the end of the social,” where there is no “absolute text,” as Giorgos Veltsos boldly claims in his first play, Camera Degli Sposi (1993). In short, what was required was a drastic change of course which would open the subject to the availability of his or her “own historicity and mutability” (for more see Docherty 213). The coming of the economic crisis in 2009 has changed a lot of things, structural as well as ideological. The scarcity of money in the business sector, in combination with the absence of state funding have led to huge debts, deeper cuts, unpaid rent, difficulty to meet staff payroll. Full-time positions and overall seasonal positions have been slashed. Production in materials and support services are cut. Shorter employment contracts introduced. Most actors work with no pay. Many shows are announced but equally many do not see the light of day. They are postponed, which means they drift permanently off the map. Even companies which for many years managed to maintain impressive standards have ran out of steam (i.e. Aplo Theatro [Απλό θέατρο], Theatro tes Anixis [Θέατρο της Άνοιξης], Amphitheatro [Αμφι-Θέατρο], Piramatiki Skini [Πειραματική Σκηνή], among others). Regardless of size, all playhouses announce a series of preemptive measures to save off a total financial meltdown. They offer special prices for the unemployed, the students, and those hit the hardest by the economic situation. In many cases spectators are asked to give what they want or can afford. Even so, very few shows run long enough to recoup their initial investment and hope for profit afterwards. There are too many shows competing for the entertainment family budget and that makes the repertory choices very risky business. Yet, what is most interesting is that at the periphery of local theatre activity, about a hundred smaller and younger companies, although hit the hardest by the economic downturn and the absence of state subsidies, still soldier on in an increasingly disheartening environment. It suffices to say that a record high of close to one thousand productions saw the light of day in Athens alone between September 2014 and August 2015, that is, in the heart of the depression, most of them by young artists who insist on searching for the dark, the advanced, the violent, the difficult. Something similar, but not of the same output, took place in Thessaloniki over the same period of time (about two hundred productions). It is quite obvious that depression Greece has provided a rich field for an analysis of the relation of art to the events of the day. The experience of the devastation of the economy and the growing threat of an even lower quality of life, is producing a new sense of things, of people, of human relations. This shift of perspective is finding voice in theatrical signs and productions as diverse as the narrative style of news reports (a kind of revived “Living Newspaper”), the return of political stage discourse, the return to community projects. Within this particular cultural climate, these options achieve a popularity that is historically unusual. Among the two thousand Theatre Equity members, the young seem to be now the most restless and at the same time the most reliable chroniclers of the depression. They are the ones who set out to represent “reality” in a way that seems true (accurately descriptive) to them. They feel that their must-do-job is to keep theatre central to the public discourse and communal interaction; not as a commodity but as a necessary thing. Which is not easy to do, for that means to change people’s general attitude towards theatre and towards life and its “realities.” It is impossible to categorize, let alone adequately present, everything that is happening in Greek theatre in a single paper, let alone a short introduction like this, for they do not form a coherent entity. It is not only the volume that makes categorization problematic but also the fact that needs and focus vary. Some are more politically oriented (ODC, Kanigunda, Blitz, Prodromos Tsinikoris, Anestis Azas, Georgia Mavragani), others are more aesthetically oriented (Bijoux de Kant, Simio Miden, Choros, Vasistas, Nova Melancholia, Noiti Grammi, etc.). Some are more professional, which means they care more about the correct outcome and others more ad hoc, messier and undisciplined. Yet despite the difficulty to provide a coherent map of what is going on certain patterns do emerge and offer ways of understanding better how contemporary Greek theatre/drama has developed in the last couple of decades and how this development relates to cultural matters as well. What links together most of the people involved in Greek theatre/drama today and somehow makes their en bloc study possible is their desire to capture the diversity of the country as it shifts and changes through the impact of illegal immigration, recession, impoverishment, disappearing state funding, collapse of the welfare system, corruption. A good part of Greek theatre practitioners and writers take advantage of the civic awakening and engagement. They do not turn their backs on politics. They are gradually getting more society aware; they betray more freedom to experiment, to flirt with other disciplines. They are more sensitive towards the notion of theatre as an educational tool, more sarcastic towards established notions and values. They understand that the situation of theatre in an economically and culturally threatened world requires radical rethinking. The old methods and the old mentalities cannot help; they proved lacking. New strategies are needed if one wants a future for theatre as an ethically and politically alert art. That does not mean that the past (and whatever that entails) is rejected or sacrificed to the altar of the new. Whether in the form of an “alteration” or an “imitation,” “spinoff,” “appropriation,” “abridgement,” “transformation,” “version,” “offshoot” or “tradaptation,” the past, ancient and more recent, is constantly reshuffled, reterritorialized, and rehistoricized in order to suit better the situation created by the economic crash. And the most telling example of this is the repertory of both the National Theatre in Athens and the National Theatre of Northern Greece in Thessaloniki for the period 2010-2013. The two biggest theatre organizations of the country, shortly after the crisis broke out, abandoned their earlier plans and turned the question “What is a motherland?” into the governing principle of their repertory policy. What they were seeking was mainly grassroots plays that touched upon issues which had to do with the component parts of the nation, its national character, its historical process, its folk traditions and current problems.1 By emphasizing the centrality of the nation they wanted to show to people that they had a mission not only to represent the nation and its pressing concerns, but also to be an inspiring force of nation rebuilding and reshuffling.2 At no time in their recent history were the two National theatres so overwhelmingly visible and dominating as they have been in the period between 2010-2013. Most plays chosen for production came from 19th and early 20th century Greek drama. Other plays, such as Yiannis Tsiros’s Invisible Olga [Αόρατη Όλγα] and Lena Kitsopoulou’s Aoustras or Couch Grass [Άουστρας ή Η αγριάδα], among others, were chosen to emphasize current problems like racism, immigration, violence, discrimination. Justifying his selections, Yiannis Houvardas, the artistic director of the National Theatre (Athens), said in his Press Conference (2010) that at a difficult moment like this, we should go back and re-examine the notion of coherence, continuity and national identity. “We open the chapter ‘Greece’ with a triple query: how we see ourselves, how the others see us, and what is the meaning of Greece today? We would like to look again into Greece’s essences and dynamics as they register on its culture. We want to draw on the wide spectrum of Greece’s history. . . . We want to cross centuries of creativity . . . looking for a convincing answer to the question ‘What is a motherland?’ Our goal is a panorama of the nation’s evolution . . . how the others have seen and still see us. . . . Now, more than ever, we have to see what’s been left from the ancient world, the Byzantine, the post-independence war, and how all these converse with our contemporary culture.” Sotiris Hatzakis, the artistic director of the National Theatre of Northern Greece, on his part, justifying his own choices claimed that “the country needs exemplary models and high moral standards. . . . Love for the country, self sacrifice, heroism, social camaraderie, and unselfish struggle are virtues that belong to all of us and claiming them we keep our country’s history alive and we offer our children a better future” (Aggelioforos 18 Nov. 2012). The aim of this collection of essays is to provide a multifaceted overview of the geographies of contemporary Greek drama and theatre from 1981 to the present. They are arranged in three sections according to their main focus. The first four essays form the first section which focuses on the playwright. Not far from Papazoglou’s essay is the contribution of Eleftheria Ioannidou and Natasha Souziouli which focuses on the Hellenic Festival and the Introduction 13 question of identity. 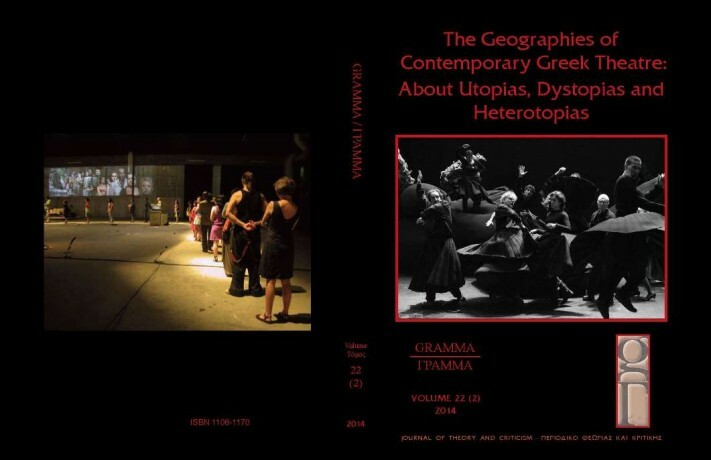 The writers of the essay claim that the years from 2010 to the present marked a rupture with previous discourses and politics, turning the Hellenic Festival into a topos of transformation and fluidity which seems to elude certain conditions of production and reception pertaining to its past history. The article presents an inquiry into the official policies as much as the artistic practices which constitute this topos, while also mapping out the emergent trends that produce its particular dynamic. “Directors’ theatre” in Greece came into full bloom in the early 1990s, Avra Sidiropoulou writes, “when a combination of social, economical, and cultural factors rendered possible the establishment of a new sensibility in the arts scene of the country.” Together with a variety of corroborative phenomena, such as the proliferation of alternative theatre spaces, the country’s intense festivalization and the infiltration of drama schools by acting and staging methods brought back home by artists who had spent several years studying in Western Europe, new paths and techniques developed in the performing arts, mostly with regards to the introduction and systematic application of a non-realistic, decidedly postmodern aesthetic onto the stage. Ioulia Pipinia and Andreas Dimitriadis use the production of Golfo, the nineteenth century (1894) tragic pastoral of Spyridon Peresiades, by the National Theatre in order a) to explore the ways the recent production rewrites the original text and negotiates its role in stage history, by disrupting its performative boundaries and refashioning its dramatic code; and b) to discuss the haunting image of a society in mourning that the performance fosters, at a time when economic crisis and political instability incite feelings of despair and acts of violence, in response to what is often described, concerning the recent situation in Greece, as a process of modern colonization. The last four essays are grouped together in section three because they all tackle the issue and the problematics of space (and by extension, identity). Each in its own way discusses “the endless possibilities that performance brings to the formation of unsuspected modes of attention” (Banes and Lepecki 4); how theatre can operate as a cultural force mediating change; what it means being in the world and its variable ecosystems (Kelleher 2009). In the last few years, Katia Arfara maintains in her paper, we have seen many Greek artists concentrating more and more on the re-enactment of sociohistorical events, hoping to deflect people’s gaze from the habitual voyeuristic consumption of representations, and turn it on the politics of viewing and the politics of the performance. To support her argument she focuses on devised theatre, which, according to her view, is the dominant trend in the independent Greek theatre scene for more than a decade now. Her example is the Blitz Theatre Group, formed in October 2004 by Angeliki Papoulia, Christos Passalis, and Giorgos Valais in Athens. Since their first work, Motherland (2006), Arfara writes, Blitz have been constantly engaged with hybrid modes of narration which blur the boundaries between dialectical forms and monologues, literary sources and documentary materials. More specifically, her paper analyzes the group’s latest productions, Cinemascope (2010) and Late Night (2012), because they exemplify the Blitz dramaturgy of Time. The aim of the paper signed by Marina Kotzamani, is to flesh out the significance of space and performance to Iannis Xenakis’ approach to history and national identity (in Polytropon, 1978) and to relate it to earlier and later environmentally sensitive art work in Greece, including the Delphic Festivals of the inter-war period, the opening ceremony of the 2004 Olympics, as well as contemporary experimental performance. Her reading of Xenakis’ work is in accord with recent scholarly attention on the impact of space and performance to the conception of national identity in modern Greece. Giorgos Pefanis’ essay is also inspired by street theatrics. According to the writer, the very public nature of the street makes it more “hospitable” to the unpredictable and the unexpected; it carries a hidden dynamic that surfaced very strongly during the occupation of public spaces by Greek people in the years of the economic crisis. While people gathered without any clear objectives, the International Street Theatre Festival (Istfest) of Athens (2009-2014) organized at that time, provided them with a significant “role”: to participate in a multi-faceted theatrical celebration, with strong political connotations. In more ways than one, the street, (in the broader sense of the public domain, of the open, collectively shared urban and planned city space), “returned through the Festival (and theatre) to the people, the original owners,” Pefanis claims. It is still too early to know whether those cultural shifts, which most papers in this volume discuss, can produce lasting art. Considering the hardships local people experience, what is certainly required is a forward looking energy, a jump into a new age, a vision of a new political, institutional, ethical, and economic system, new mores, and an art suitable to the needs of the people and the potential of the nation. But most importantly, what Greek theatre is in need of is a clearer idea of who it is and what it really wants from this world. Of course, many things have changed for the better. There has been a widening of the artists’ understanding of theatre, in the sense that it is now more porous and receptive, mostly situated on the boundary of what we know and do not know, of what we think is theatre or not theatre, of what is out there on stage and what out here in the auditorium. Yet, there are still many questions that it has to confront; questions that have to do with changing local and international conditions, ranging from globalization to migration and identity politics, to name a few. And depression Greece, with whatever evils it has brought along, provides a rich field for selfreflection and also a terrain for the production of a new sense of things, of people, of human relations, of companionship, of goals and aspirations and, of course, drama/theatre. Banes, Sally, and Andre Lepecki, eds. The Senses in Performance. New York: Routledge, 2007. Print. Baudrillard, Jean. “The Ecstacy of Communication.” The Anti-Aesthetic. Ed. Hal Foster. Seattle: Bay Press, 1983. Print. Docherty, Thomas. After Theory: Postmodernism/Postmarxism. London: Routledge, 1990. Print. Jameson, Fredric. “Postmodernism and the Consumer Society.” The Anti-Aesthetic. Ed. Hal Foster. Seattle: Bay Press, 1983. Print. —. Postmodernism, or the Cultural Logic of Late Capitalism. Durham: Duke UP, i1991. Print. Kelleher, Joe. Theatre and Politics. London: Palgrave, 2009. Print. Mouffe, Charles. “Radical Democracy: Modern or Postmodern.” Universal Abandon? The Politics of Postmodernism. Ed. A. Ross. Minneapolis: U of Minnesota P, 1988. 31-45. Print. Veltsos, Giorgos. Camera Degli Sposi. Athens: Plethron, 1993. Print. Savas Patsalidis and Anna Stavrakopoulou. Associate Editors Sue-Ellen Case, University of California at L.A.
Thessaloniki, in collaboration with the Publications Department of the university. © Copyright: Publications Department and School of English, Aristotle University of Thessaloniki. without the written consent of the Publications Department and the School of English. Back Cover: Photo: From the performance of Dying as a Country, Athens Festival,ιdir. Michael Marmarinos, 2012. Courtesy of Eleni Petasi. Angelaki, Vicky, ed. Contemporary British Theatre: Breaking New Ground. Basingstoke: Palgrave Macmillan, 2013. Pp 192. ISBN: 978-1-137-01012-4. Twenty-First Century. Sarah Ruhl and her Contemporaries. New York: Palgrave, Macmillan, 2013. Pp 215. ISBN: 978-1-137-28710-6. McConachie, Bruce. Theatre and Mind. New York: Palgrave Macmillan, 2013.
on his Plays, Poetry and Production Work. Manchester: Manchester UP, 2013. Pp 238. Rapti, Vassiliki. Ludics in Surrealist Theatre and Beyond. Farnham, Surrey: Ashgate, 2013. (Series: Ashgate Studies in Surrealism.) Pp 210. ISBN 978-1-4094-2906-7.